Programming plays a large role in our libraries. It is a “material,” and personal justification in our budgets. How do we justify the programming expenses, provide a variety of content, and increase the appeal to all age groups? This webinar will look at the elements that affect our communities and connect with the “Libraries = Strong Communities” theme for National Library Week 2019. In the end, using programming, we will discover how we can partner, plan, and provide for our community. 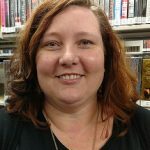 Heidi O’Hare is director of the Tomahawk Public Library. She grew up in the Wausau area, and earned her Masters degree from University of California-Irvine, and also holds a BFA from the University of Wisconsin-Stevens Point. Her research areas include couture fashion, historical clothing, and Leonardo da Vinci. During the last ten years, O’Hare was a college professor in North Carolina. Ultimately, the pull of family and community brought her back to the Northwoods. Questions? Contact Jamie @ jmatczak@wvls.org or 920-455-0668. This webinar is brought to you in partnership with the Southwest Wisconsin Library System.